The 411 on how many hours of sleep you need and how to get a better night’s rest, naturally. How much sleep do you get each night? It might surprise you but if you’re clocking less than seven hours, you’re probably not giving your body the rest it needs. In fact, studies prove that a third of adults are running on less than the recommended amount of sleep — and it’s affecting our physical, mental and emotional health. This month, we are focusing on the pillars of holistic wellness, one being sleep. A good night’s rest is believed to reduce your chance of illness, stress and chronic fatigue. At Saje, we like to say that tomorrow’s to-do list starts the night before. Check off “get a good night’s sleep” now and you’ll start each day with more energy, more focus and more wellness. Read on for remedies and rituals that will calm your nerves, soothe your body and help you get the rest you need to wake up feeling refreshed. We’ve all done it: rush through our task lists well into the evening, then flop into bed hoping our brains will turn off so we can fall asleep. But when our overstimulated brains are still in an active mode, sleep doesn’t come easy. To give your mind an opportunity to slow down and prepare for rest, try creating an easy-to-follow evening routine. Set your bedtime and your alarm for the same time every day, allowing for at least eight hours of rest in between going to bed and getting up. Start your bedtime routine in the same way every night: make a cup of herbal tea, soak in a warm bath, or choose another simple routine that helps you wind down and relax. You can also breathe in rest by adding a calming essential oil blend to your ultrasonic diffuser (Tranquility and Unwind are good options), or misting your pillow with Sleep Well or Lavender Mist to access the calming benefits of chamomile, lavender and vetiver. 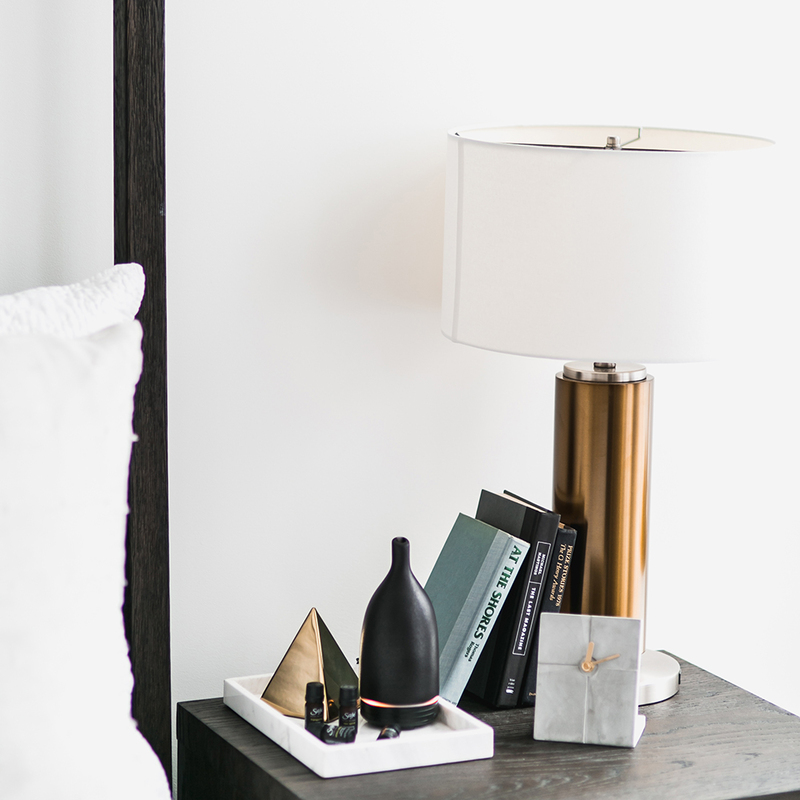 Our Aroma Om Ultrasonic Diffuser is small enough to fit on a bedside table and will release a gentle mist while you doze off (and it turns off automatically when it runs out of water). Sometimes, by the end of the day, we’ve been sitting for eight hours or more, staring at screens or stuck in traffic. Moving your body — whether it’s a gentle walk around your neighbourhood or an intense spin class — can release built-up energy in your body and help you physically prepare for rest. If you feel like you’re low on energy during the day, skip the coffee and go for our Energy Revitalizing Remedy, or add the uplifting power of citrus to your diffuser with Liquid Sunshine Diffuser Blend. 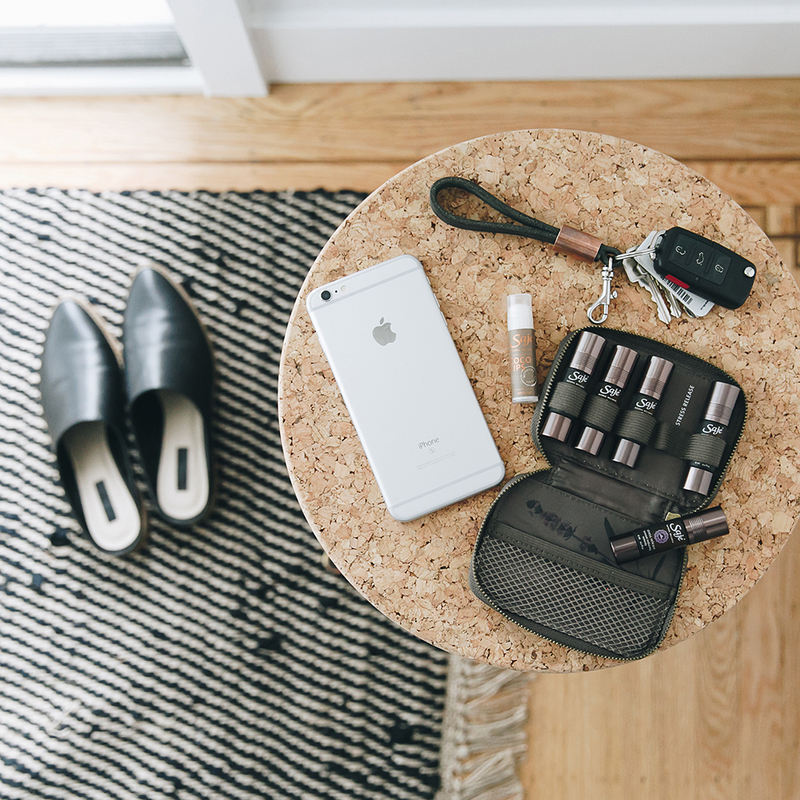 The portable Aroma Roam Ultrasonic Diffuser can move from your desk to your car, so you can get a boost of your favourite energizing essential oil blends wherever you need it. When we aren’t on top of our body’s basic needs, like drinking plenty of water and eating nutritious food, our minds retreat into a state of stress. It’s important to stay on top of your eating patterns and hydration levels. It will keep your body calmer throughout the day and make falling asleep at night that much easier. Get up a little earlier to eat breakfast, set a timer to drink a glass of water every hour, and eat a healthy dinner at least two hours before bed. Your body will thank you by drifting off to sleep more easily. The science is in and screen-based technology is out — of the bedroom, that is. Interacting with our phones, tablets and laptops in the hours before bed disrupts the brain’s ability to transition from day to night. Checking Instagram one last time before turning off the lights does more harm to our sleep than it might seem. Turn your phone to silent and charge it in another room so you won’t be tempted to check social media, email, text messages, or anything else that might keep you awake for longer than you’d like. Instead, plug in our Aroma Cloud Ultrasonic Diffuser for a gentle light and a cool mist full of the healing power of plants. Set yourself up for daily success by eating well, moving your body and making the calming, soothing benefits of essential oils a part of your nightly routine. 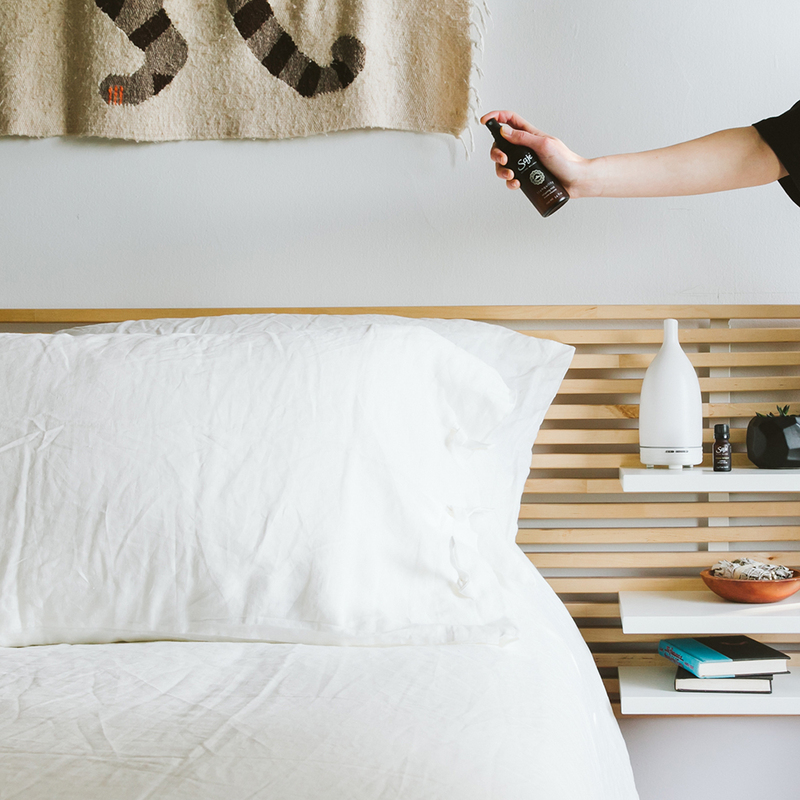 Discover our sleep-aiding oil blends and diffusers online (we ship worldwide! ), or head into one of our locations across North America. We're here to help you sleep better, one breath at a time.